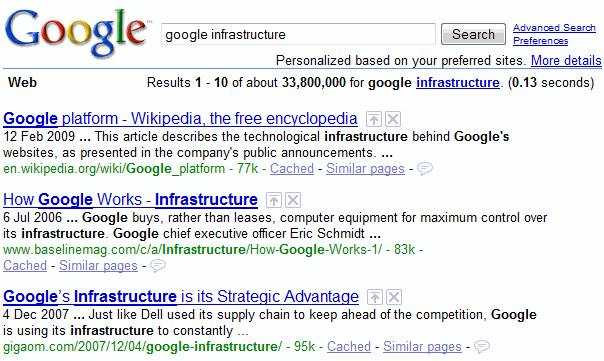 How many servers process a Google query and serve the top search results? Google Fellow Jeff Dean says that more than a thousand machines are necessary to obtain the search results in less than 200 milliseconds. "Their performance gains are also impressive, now serving pages in under 200ms. Jeff credited the vast majority of that to their switch to holding indexes completely in memory a few years back. While that now means that a thousand machines need to handle each query rather than just a couple dozen, Jeff said it is worth it to make searchers see search results nearly instantaneously." Getting the result from 1000 machines, that too less than 200 milliseconds is awesome. Tech moves faster day by day. This high technology usage is one of the factor that helps Google to stand on Top 1. The electical power requirements are staggering. you aren't the only person using those thousand servers at any given time. it probably uses less electricity than running a compact fluorescent light bulb for the 200ms. There are 7 computers running in my house for 3 people. How many servers do you think Google runs per concurrent user? .00001? Less? IMHO probably much less. What if Google making this kind of information available to so many people has a actually resulted in a net energy gain? This high technology usage is one of the factor that helps..